Please tell your friends about "GRAS - TEDS - Technical Info"
TEDS, or Transducer Electronic Data Sheet, is a set of electronic data in a standardized format defined within the IEEE 1451.4 standard. This data specifies what type of sensor is present, describes its interface, and gives technical information such as manufacturer, type number, serial number, sensitivity calibration date, reference condition etc. A TEDS sensor is the same as "Plug and Play" sensor, as the sensor via it’s internally memory can identify and describe itself to the Data Acquisition System and perform automatic system configuration. What are the advantages of TEDS? 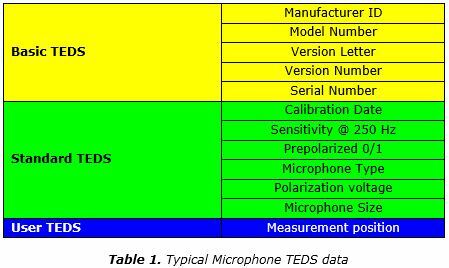 A Microphone with TEDS will typically consist of the data shown in table 1. TEDS are available in both standard preamplifiers as well an in CCP (ICP) preamplifiers. In standard preamplifiers, preamplifiers with 7 pol. LEMO plug is one of the pins (5) used for TEDS Data and the ground is shared, as shown in fig 2. In the two wires CCP preamplifiers are the TEDS DATA signal shared with Microphone signal, as shown in fig. 3. If you have any questions concerning TEDS please contact support here.